Your Entry Fees are Paid! Almost any "rodeo cowboy" can relate to talk about entry fees because; entry fees are one of his greatest expenses. Having someone pay all your entry fees would be any cowboy's dream. The good news is that somone has paid in full everyone's entry fee for the National Finals up in the sky. 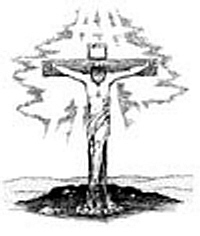 The payment was made by Jesus Christ, who died on the a cross nearly two thousand years ago. Why Did Jesus Christ's Dying On A Cross Pay Our Entry For Heaven? You may be a good person and do many good things. You may treat people right and even go to church every Sunday. God's word says that is not good enough and it never will be. God made us to be his friends and to enjoy an intimate sharing life of love together. The problem is none of us are perfect in every way and in order to have a relationship with God, you have to be PERFECT! But there was ONE man who was perfect. His name is Jesus and He took all your imperfections on him and agreed to be the sacrifice that would wash your imperfection away. If he did that and you accept what he did for you, THEN you can have a relationship with God because NOW you are perfect too! He exchanged his perfection for your imperfection. He gives you a brand new spirit that is exactly like his spirit. Sin Is Basically An Indifferent Independent Attitude Towards God! When it comes right down to it, more people than would like to admit, believe that there really is a God, but in reality are saying to him, "God, you do your thing and I'll do mine, and let's not bother each other, OK? God says, "I can't handle that because I love you too much to leave you alone." How Can I Become A Christian And Know For Sure I Have Eternal Life? By my faith in Jesus Christ and his sacrifice and forgiveness through him, I'm a blessed person to whom the Lord will NOT impute sin. If you do something wrong, go to God and ask him to forgive you, but just as in a marriage relationship, when one does something wrong to his mate, he confesses his sin to clear the air, yet the sin does not make him unmarried. Neither does our sin change our right standing with God. Becoming a Christian is not a decision in your own will power to be a "do-gooder" or to get all "religious" (Jesus actually hates religion!) and therefore hope to earn God's favor. God Loves Us More Than We Love Ourselves And Has A Plan To Get Us Sinners Back To Him! For God says he will accept and acquit us declaring us not guilty if we trust Jesus Christ to take away our sins. We all can be saved in the same way, by coming to Christ, no matter who we are or what we have been like. Yes, everyone has sinned; and fallen short of God's orginal plan; yet now God declares us, "not guilty" for God sent Christ Jesus to take the punishment for our sins and to end all God's anger against us. He used Christ's blood and our faith (trust) as the means of saving us from his wrath. God Has Paid The Entry Fees So Cash In On It! If a guy were to offer to pay a cowboy's entry fees for the rest of his rodeo career, the cowboy would never receive the benefits of that offer unless he believed the man enough to go down the road and claim it. By the same kind of FAITH/ACTION, we can claim eternal life and real forgiveness of sins. Why Don't You Give Them The "Nod", And Open Up Your Life To Jesus Christ Now And Ask Him To Be Your Lord And Savior? Just talk to God in your own words from your heart. Are you having trouble with the prayer to him? Dear Jesus, I know I'm not perfect. I've sinned against you, my family and friends. Forgive me of all of my sins and save my soul. I don't want to be the same person I used to be. I turn away from my old life and ask you to come into my heart. Please lead me all the days of my life. Show me how to grow in my relationship with you and give me wisdom to understand your word and your voice. Give me a hunger for your word that I might grow to be more like you. Thanks for saving me and giving me a brand new spirit! If you have prayed and asked Jesus to come into your heart, please write or call (907-623-7500) and tell us. We want to rejoice with you and encourage you in your new life! Links You May Find Helpful!